LA QUINTA, Calif. - Stanford shot one over par in the final round on Wednesday of the Prestige at PGA West on the Greg Norman Course. The Cardinal (285-290-285) finished fifth at eight-over 860 (9 shots behind Washington and USC who tied for 1st). Stanford frontrunners Cameron Wilson (67-72-74) and Andrew Yun (72-68-73) tied for seventh at an even-par 213, 8 behind Pedro Figueiredo of UCLA. Wilson opened the tournament with a solid 67 after making four birdies and no bogeys. Despite the windy conditions, he shot one over in the second round to stay in contention for the title. The junior, however, fell a few spots n the third round after a three-over finish. As for Yun, his best round in the tournament came with the winds. The senior shot a 68 in the second round after carding five birdies. His one-over and two-over finishes in the second and third rounds kept him on par. Sophomore Patrick Rodgers (70, 76, 69) came in two strokes behind his teammates at 215, tying for 15th. He had three birdies and an eagle in the final round. Rounding out the lineup senior Steve Kearney (76-79-69) finished tied for 51st at 224 while freshman David Boote (76-74-78) tied for 65th at 228. Freshman Dominick Francks (77-73-74) led the Cardinal individuals for the final two rounds, tying for 51st at 224. Andre DeDecker (73-80-76), a redshirt junior, finished tied for 69th at 229. At 78th was sophomore Patrick Grimes (71-87-76) at 234 and tied for 81st was Shane Lebow (76-91-73) at 240. LA QUINTA, Calif. - Stanford stands in fifth place at six-over-par 290, after the second round Wednesday morning at the Prestige at PGA West on the Greg Norman Course. Due to darkness, Tuesday's second round finished Wednesday morning after eight groups teed off at 7 a.m. Under very windy conditions, Washington and UCLA were the only two teams to shoot under par, sharing a first-place lead at 565. The Cardinal trails by 10 strokes. Senior Andrew Yun led Stanford in the second round after recording a three-under-par 68. Yun birdied the second, eighth, 10th, 11th, and 14th holes. "The conditions were tough," said Yun (72-68), who currently ties for sixth at 140. "I practiced hitting some low shots, keeping it underneath the wind and trying to manage my game as best as I can. Luckily I executed all of the shots I wanted to hit and kept it in play, which was really key." Cardinal frontrunner Cameron Wilson (67-72) shot one over to tie for fourth at 139. An early double bogey derailed the start of his front nine but the junior made a birdie on the eighth, 11th, and 12th to keep his lead. Shooting five over, sophomore Patrick Rodgers (70-76) finished the second round tied for 26th. 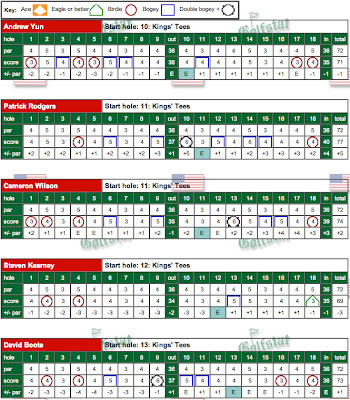 Freshman David Boote (76-74) tied for 52nd while senior Steve Kearney (76-79) finished in 73rd. The Cardinal individuals were led by freshman Dominick Francks (77-73) who shot two over to tie for 52nd. Redshirt juniorAndre DeDecker (73-80) finished tied for 63rd. Tying for 77th was sophomore Patrick Grimes (71-87). Junior Shane Lebow (76-91) finished at 87th in the second round. More winds greet the 15-team field on Wednesday. "You just have to keep the ball down and take the spin off of it," said Yun. "For the most part, the hardest thing to do is keeping the ball in play off the tee because the driver goes the farthest so it's the most likely to get off line especially in the wind." LA QUINTA, Calif. - Stanford is tied for seventh place at one-over-par 285, after the opening round on Tuesday morning at the Prestige at PGA West on the Greg Norman Course. Monday's first round was halted due to darkness and play resumed Tuesday morning. The remaining 10 groups teed off at 8 a.m. and finished soon after the first group in the second round began at 10 a.m. Junior Cameron Wilson led Stanford with a four-under-par 67 after four birdies and no bogeys, tying for first. "I got off to a good start and made a bunch of putts on the front nine," said Wilson who birdied the second, fifth, eighth, and 13th holes. "In the back nine, I hit the ball much better but I couldn't make any birdie putts. I made a lot of good decisions and I didn't put myself in too much trouble." Under ideal conditions, five teams shot under par in the first round with TCU in first with a 278, seven strokes ahead of the Cardinal. "All in all it was a decent start," said The Knowles Family Director of Golf Conrad Ray. "I think the tournament will get a little interesting based on the weather forecast. It's supposed to get a little windy in the next couple of days and the course changes a lot with the wind. We'll just wake up tomorrow and see what it brings, and keep working hard." Sophomore Patrick Rodgers carded two consecutive birdies on the eighth and ninth holes to head one over into the back nine where he made two more birdies on the 16th and 18th. Rodgers finished the round with a 70, tying for 11th. Andrew Yun, the senior from Chandler, Ariz., recorded a 72 for a tie in 28th. Rounding out the field are freshman David Booteand senior Steve Kearney, tied for 64th at 76. "The course is fairly simple in many terms until the wind gets up so the guys should try to keep it in the fairway and plan to play two under par," said Philip Rowe, Stanford Enlight Foundation Assistant Coach, about a good team score on the Greg Norman Course. "That adds up to eight or 10 under par as a team. When the wind gets up, though, that's when the scores start separating." For the individuals competing for the Cardinal, sophomore Patrick Grimes leads with 71, tying for 21st. Redshirt junior Andre DeDecker finished at 73 for 47th. Junior Shane Lebow tied for 64th at 76 and freshman Dominick Francks tied for 72nd at 77. With the second round comes another test. "I think today one key for me was being very patient," said Wilson. "There's so many birdie holes that if you leave a couple out there, you can get frustrated so just trying to stay as patient as I can be." LA QUINTA, Calif. - Stanford, up one spot to No. 14 (Golfweek), takes on a 15-team field on Monday at the 13th annual Prestige at PGA West, a tournament co-hosted by the Cardinal and UC Davis on the Greg Norman Course. This 54-hole event is the 13th annual Prestige at PGA West. There will be three rounds from February 18-20. Live scoring will be available on GameBook. Eleven teams return from the Amer Ari Invitational, including No. 4 Washington and No. 6 UCLA, who tied for first at 22-under-par 842. No. 13 Texas Christian took third at 849, while No. 8 USC carded an 850 tying for fourth. Stanford placed seventh at 852. "We talked a lot about dialing in our wedge games and proximity to the hole with scoring clubs," said The Knowles Family Director of Golf Conrad Ray about the practice week leading up to the Prestige. "[We] talked about treating each day as a mini tournament in itself." Ray starts a lineup featuring sophomore Patrick Rodgers, senior Andrew Yun, senior Steve Kearney, junior Cameron Wilson, and freshman David Boote. Junior Shane Lebow, freshman Dominick Francks, redshirt junior Andre DeDecker, and sophomore Patrick Grimes compete as individuals for the Cardinal. "For this week I'm trying to hit a fade (left to right) on almost every shot," said Rodgers. "This course sets up for that shot especially off the tee, and ball control around here is critical for success." 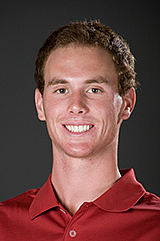 Stanford won the team event in 2006 and has produced two individual champions, Zach Miller (2006) and James Lee (2000). "My goal this week is to have great balance and a positive attitude," said Yun. "My key words are "slow flow.'" The Cardinal shot the lowest final round of the day, an 8-under par 280 to move up to a 7th place finish only 3 strokes out of third place. The team finished the tournament 10 strokes behind UCLA and Washington who tied for first place overall, picking up 7 strokes on the lead in the final round. Stanford shot progressively better each round scoring 287-285-280 team totals. Only a couple of late bogies and a double bogey kept the Cardinal from finishing in 3rd place. Certainly the week's highlight for Stanford was the breakout tournament performance by senior Steven Kearney who finished with a 5-under 67 to tie for 4th overall, his best career finish in a college tournament. 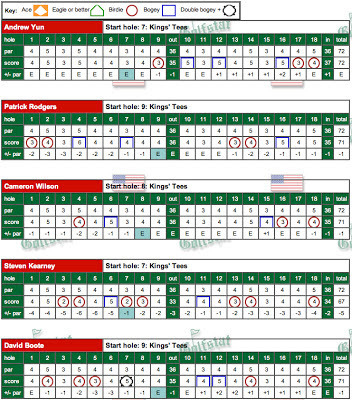 Steven's final round included 7 birdies and only 2 bogies. Steven had rounds of 69-72-67 for a 8-under 208 total. Well done! The rest of the season looks bright with all five starters capable of competing for an individual title in any event. "My short game was pretty good in this tournament," said Kearney who shot seven birdies today for a five-under, his best round of the tournament. "My driving accuracy was definitely one of my strong points. I only missed a few fairways these last three days and that really set me up to play well." "I'd like to keep going with the momentum I had right now," said Kearney. "If I keep working on that putting, I feel like I could really shoot well next week in Palm Springs and help out the team again." Three Stanford players shot 1-under 71s in the final round, Cameron Wilson (74-71-71 216 T33), David Boote (73-72-71 216 T33) and Patrick Rodgers (77-79-71 281 T49). Andrew Yun had a final round 72 to finish tied for 26th overall (71-72-72 215). Playing as an individual Shane Lebow finished tied for 70th with rounds of 74-76-72-222. "Overall I thought my game and my mental game was pretty good," said Yun. "I know there are some aspects of my game that I need to work on like iron shots and putting in general." "We had some solid scores," said Philip Rowe, Stanford Enlight Foundation Assistant Coach. "Those one under pars were challenging in the breeze. Each player probably felt like they left a few shots out there, so there's plenty to work on." "We had it going actually with a few holes left, but we gave a couple back in the end when we turned back into the wind on this course," said The Knowles Family Director of Golf Conrad Ray. "We're happy with the way the guys battled today. We wish we were a few slots up in the leaderboard but that's golf and it is awful close." Next up is a short turnaround in at the PGA West courses at La Quinta, in the Palm Springs area, in the Prestige co-hosted by Stanford and played Feb 18-20. 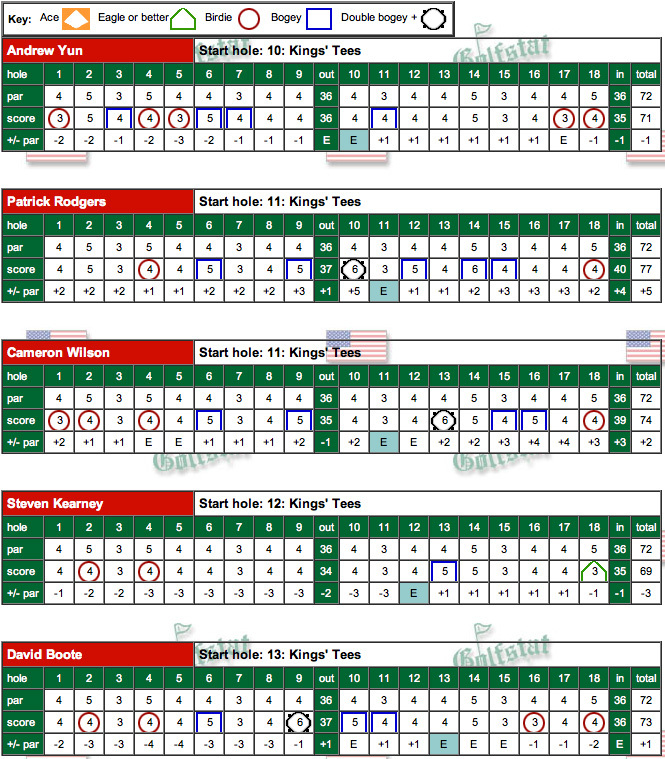 Third round scorecards can be found below --- click to enlarge. Stanford improved on its first round results by two shots, with a 285 3-under par team total but found itself moving backwards and not forwards in this strong field. 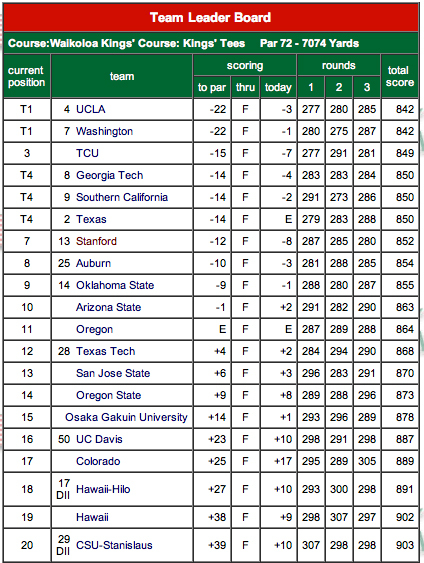 Washington now leads the 9th place Cardinal by 17 strokes after it shot a team total of 275. 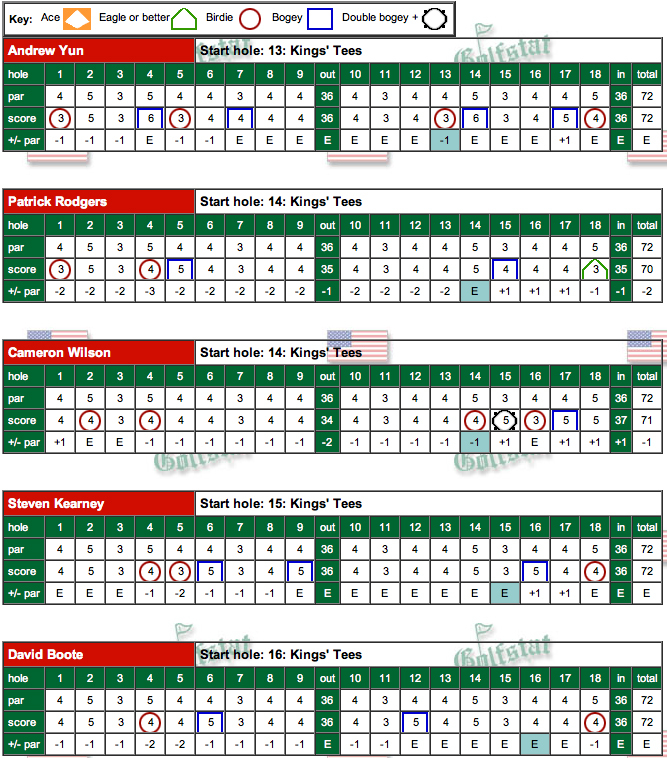 Steady play by all five golfers resulted in a 70 by Patrick Rodgers, a 71 by David Boote and three 72's by Steven Kearney, Cameron Wilson and Andrew Yun. It will take a top notch final round to move the Cardinal up in the highly ranked field. 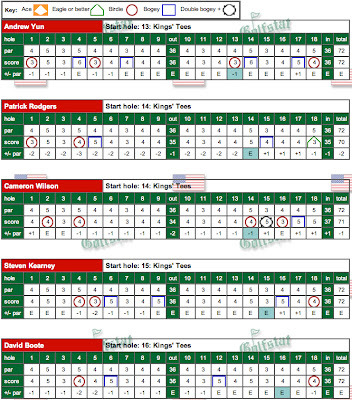 After two rounds Kearney is tied for 16th at 141, Yun is tied for 30th at 143, Wilson and Boote are tied for 45th at 145 and Rodgers is tied for 65th at 147. Shane Lebow is tied for 89th at 150. Two early birdies and an eagle pushed Rodgers to a two-under-par 70 leading the team on the second day. Rodgers, who was overcome by bogeys at the start of the tournament, came back strong after an initial five-over-par finish. "I was comfortable with my game [in the first round] but things just didn't go my way," said Rodgers who is tied for 65th at three under par. "So in the second round, I just tried to continue feeling comfortable, hitting good shots, and capitalizing on the opportunities. I got off to a pretty shaky start, missed a few putts, but didn't hit the ball quite as well as I did yesterday, [although] I did a much better job at managing my round and scoring better." Wilson, who was facing a two-over-par deficit, finished one-under with four birdies on the front nine to tie him for 45th. "My goal was to be very patient with myself," said Wilson. "The rounds were long and with the green grass around the green there's potential to get a few weird bounces. My goal was to be patient, accepting of the bounces good or bad, and take advantage of the par-5s." "The guys battled hard and made a lot of nice pars," said The Knowles Family Director of Golf Conrad Ray. "We needed a little bit more offense today. I think they felt like they could have made a little bit more birdies while some other teams went lower than we did. I think it all evens out in the end." "I think they managed their mental games in fashion today and hopefully they'll come out aggressive tomorrow with a lot of confidence," said Ray. "We haven't played our best round of the tournament yet and we're waiting for that tomorrow." "I had a couple of birdies early on and unfortunately could not finish it off in the end with a couple of silly bogies," said Boote. "But it was an improvement by one shot from yesterday so I'm fairly happy." 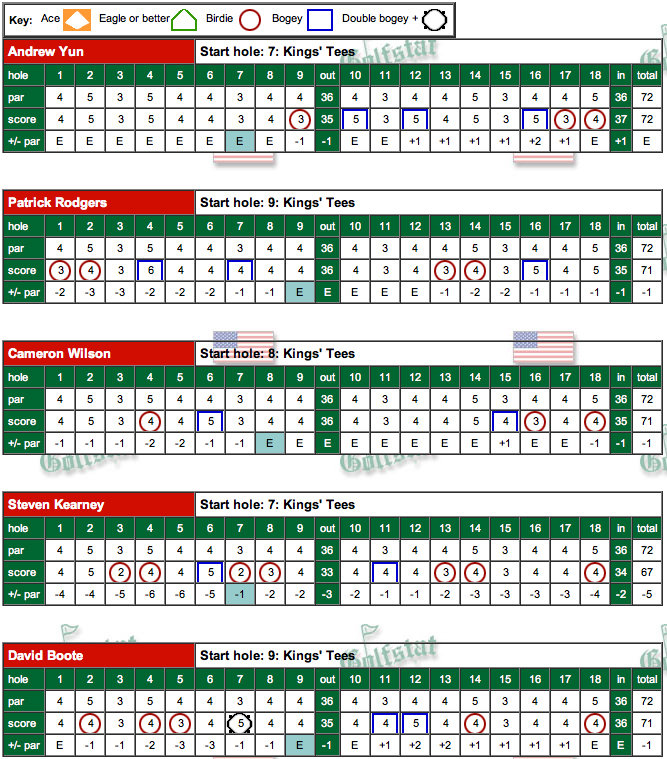 Day two scorecards can be viewed below - click to enlarge. 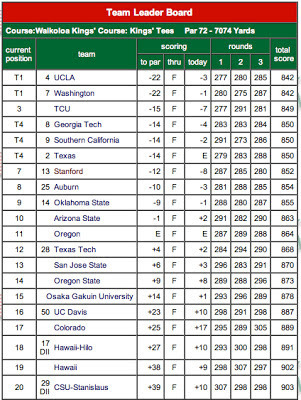 Stanford finds itself tied for 8th against a very strong field, 10 strokes behind leading TCU after a 1-under team total of 287 in the first round. The Cardinal was led by Steven Kearney's 3-under par 69 (T10) whose solid round included an eagle on 18, two birdies and only one bogey. "I hit a really good drive down the middle," said Kearney about the eagle at the par-five 18th. "The short side was left there so we decided to hit a 6-iron because the downwind would hit it to about 20 feet. Then I finally made a good putt, put a good stroke on it, made it on the right edge and it fell in there." "My goal today was just fairways and greens," said Kearney. "If the putts fall, then the putts fall." Andrew Yun finished at 1-under par 71 after posting 5 birdies and 4 bogies. "I birdied two of the par-5s by hitting on two and two putting," said Yun who finished with five birdies for one under par, putting him 23rd overall. "For the other ones I hit, my second shot was within 10 feet and I just made the putt." David Boote was 4 under par in his round at one point but ended with a double bogey, bogey-bogey finish for a 73. Cameron Wilson's 74 included four birdies but also 4 bogies and a double bogey on #13. Patrick Rodgers' 77 included an uncharacteristic 5 bogies and a double to offset his two birdies. Playing as an individual, Shane Lebow had a 2-over 74 total. "We had a lot of few easy opportunities get away from us on the course but we're still within striking distance with a couple of rounds left," said The Knowles Family Director of Golf Conrad Ray. "[Holes] 10 through 13 is a big stretch and we start around that area tomorrow. If we play those holes well and the guys manage their mental games well, we'll be in good shape for the last two days." 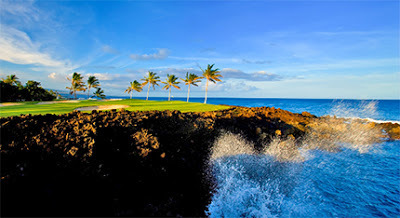 The Cardinal returns to action on the beautiful Kona side of the Big Island of Hawaii at the Waikoloa Beach King's Course as they send their strongest squad of the season to compete against a top field featuring 5 of the top 10 teams in the country. Top 20 teams with rankings include Texas (#2), Washington (#6), UCLA (#7), USC (#8), Georgia Tech (#10), Oklahoma St. (#14), Stanford (#15) and TCU (#16). Andrew Yun, 2-time senior All-American, returns to the squad after taking the fall quarter off to try to qualify for the PGA Tour. Having just missed qualifying, Andrew brings a wealth of talent and experience to the young team. First team All-American sophomore Patrick Rodgers, ranked as one of the world's top amateurs, looks to continue his outstanding fall play which included two individual wins. Rounding out the team are junior Cameron Wilson, looking to follow up his course record breaking 61 and second place finish at CordeValle in November, freshman David Boote from England who had three top 10 finishes in the fall, and senior Steven Kearney coming off strong play in qualifying for this event. Junior Shane Lebow will be competing as a junior.